Houston, TX - Former President George W. Bush is giving thanks to federal workers and calling for an end of the current federal government shutdown. 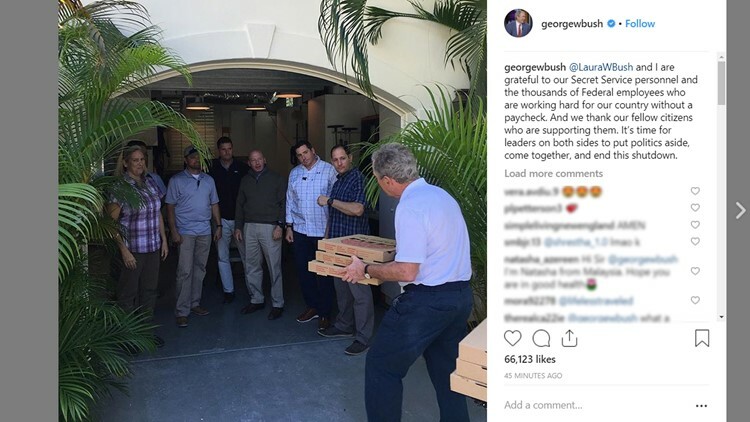 Bush posted on Instagram a photo of him delivering pizzas to his Secret Service detail. "Laura Bush and I are grateful to our Secret Service personnel and the thousands of Federal employees who are working hard for our country without a paycheck. And we thank our fellow citizens who are supporting them. It's time for leaders on both sides to put politics aside, come together, and end this shutdown." The government shutdown began December 22, and entered its 28th day Friday, with no end in site. Democrats and President Trump are feuding over construction of a border wall along the U.S.-Mexico border. Some federal workers are on furlough, while others in critical roles, including law enforcement and the military, are now going without pay.